Gene-editing methods are advancing at a rapid pace. They are being applied in a wide range of applications, including medical/pharmaceutical, agricultural, and animal health. After years of development, CRISPR/Cas9 is finally beginning to realize its full potential in the genome-editing arena. The technology is based on a bacterial defense strategy against bacteriophage infection that has been modified to knockout or knock-in DNA precise sequences. The technology is also inducible and has the ability to control transcription factors allowing the activation or silencing of genes. In this way, genes required for viability can be turned on or off at different developmental stages to elucidate gene function. CRISPR has great utility for functional in vitro and in vivo screening for cellular pathway and target identification, creating disease models and cell lines, and ultimately therapeutic applications for editing genes and their control elements. The Cambridge Healthtech Institute (CHI) will hold its fourth annual symposium on New Frontiers in CRISPR-Based Gene Editing at the Tri-Con conference in San Francisco, CA, in February. GEN interviewed several scientists who will be speaking at the meeting to learn more about recent advances in gene-editing technology and the development of new applications. C.B. Gurumurthy, Ph.D., associate professor of developmental neuroscience at the Munroe Meyer Institute for Genetics and Rehabilitation and director, Mouse Genome Engineering, Core Facility, at the University of Nebraska Medical Center, is presenting a talk entitled, “Next-Generation CRISPR Technologies for Efficient Genome Engineering.” Dr. Gurumurthy is a codeveloper of Easi-CRISPR (Easi is efficient additions with single-stranded DNA inserts). He explained, “You can utilize our technology to induce the deletion of a gene, making a conditional knockout at a particular point in development, leveraging time and space.” By using this technology with genes required for viability you can help determine gene function in a developmental context. It is an efficient technology for generating mice carrying conditional and inserted alleles using long, single-stranded donor DNA in the one kilobase (kb) and beyond range. The high efficiency and large insert size allowed by Easi-CRISPR makes it auseful new technology in the CRISPR toolbox. Figure 1. CRISPR technology can expedite the creation of complex genetic models, provided genomic insertion proceeds efficiently. Unfortunately, insertion of double-stranded donor DNA is more likely to be accompanied by inefficient non-homologous end-joining (NHEJ) than by efficient homology-directed repair (HDR). 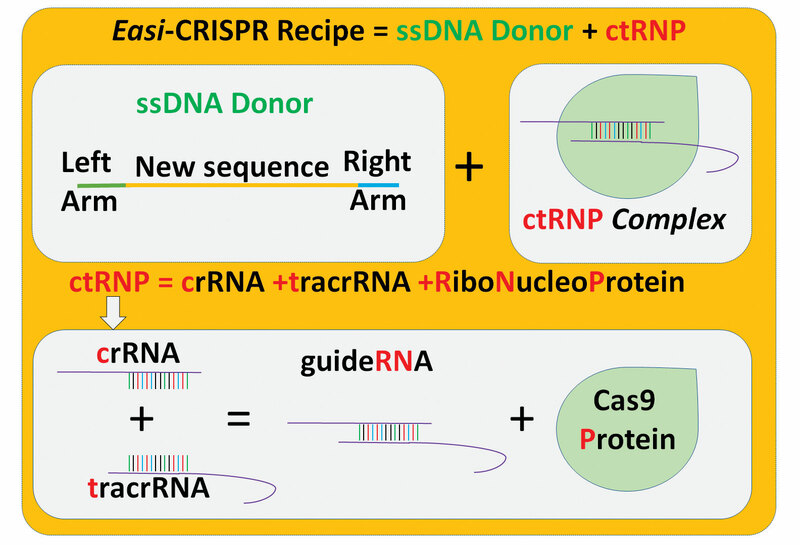 Another insertion approach, Easi-CRISPR, uses single-stranded donor DNA (ssDNA), which is injected along with preassembled crRNA + tracRNA + Cas9 nuclease (ctRNP). 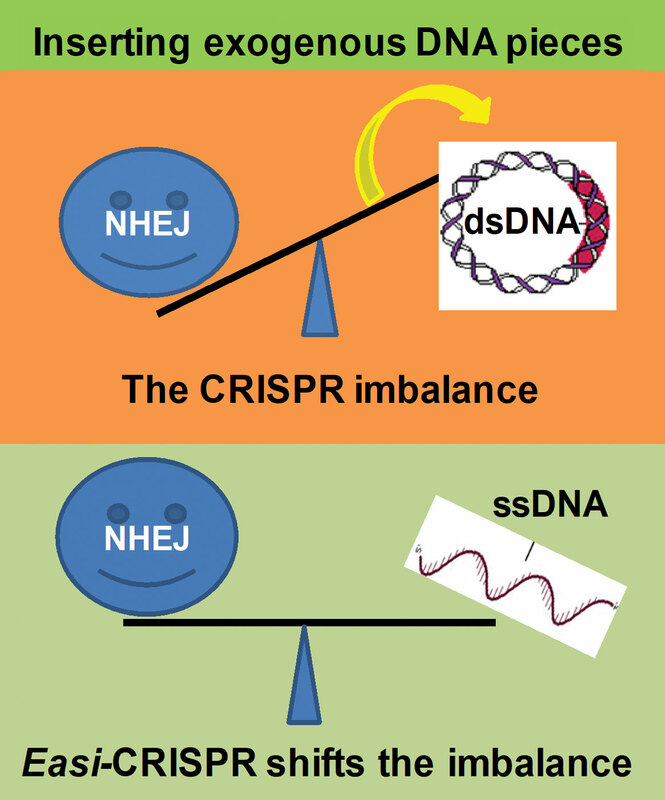 Easi-CRISPR can shift the balance of DNA repair from NHEJ to HDR. Another novel CRISPR-based tool that Dr. Gurumurthy codeveloped is the genome editing via oviductal nucleic acid delivery (GONAD) system. This is a method to make transgenic animals in an easy, inexpensive, and less labor-intensive manner. By introducing a small incision in the oviduct of a pseudopregnant mouse followed by electroporation, scientists can use the CRISPR system to deliver the gene of interest directly to the fertilized egg. This technique is a vast improvement over the traditional method used to produce transgenic animals. This method requires the highly specialized technique of microinjection (along with the accompanying equipment), the sacrifice of large numbers of animals, and a long turnaround time. Future challenges include the insertion of constructs as large as 5 kb, 10 kb, and even 20 kb. Figure 2. The Easi-CRISPR recipe shows a quick overview of the process of introducing single-stranded DNA, which allows for a longer-sized strand to be introduced into a vector. Martin Kampmann, Ph.D. is an assistant professor in the Department of Biochemistry and Biophysics at the Institute for Neurodegenerative Diseases in the University of California, San Francisco, and his talk at the conference is entitled, “Next-Generation Functional Genomics with CRISPRi and CRISPRa.” Here, the “i” stands for inhibition, and the “a” stands for activation. “Our ability to perturb gene function in a wide range of biological systems,” noted Dr. Kampmann, “has been revolutionized by the use of CRISPR/Cas9, a bacterial endonuclease that can be programmed by a single guide RNA (sgRNA) to cleave specific DNA sequences.” He recently codeveloped a genetic screening platform that utilizes catalytically deactivate Cas9 (dCas9) to recruit transcriptional repressors or activators to endogenous genes. The purpose is to induce CRISPRi and reversible CRISPRa of genes in human cells, and thereby produce genome-wide loss-of-function and gain-of-function screens. “CRISPRi overcomes the problem of off-target effects that have plagued RNAi-based approaches, resulting in high specificity while maintaining high sensitivity,” stated Dr. Kampmann. Complementary insights can be garnered from these CRISPRi and CRISPRa screening approaches (Figure 3). Dr. Kampmann feels that the next frontier for CRISPRi/CRISPRa will be its application to more complex, multicellular systems, such as organoids or in vivo screens. Such applications have the potential to dissect the important contributions of different cell types to disease processes (Figure 4). 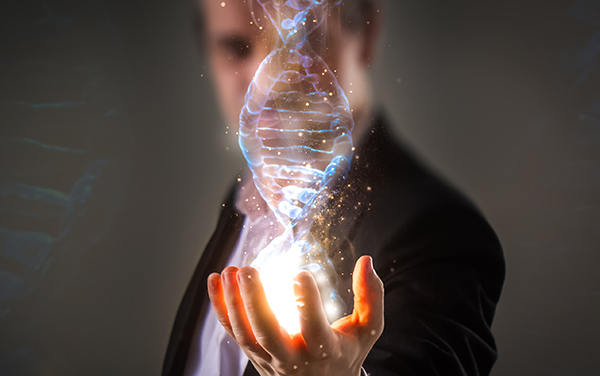 As CRISPR-based technologies mature, they are becoming rapidly accessible to the broad scientific community, thereby democratizing functional genomics. The impact on the scientific community, Dr. Kampmann maintains, will be such that we will see an exponential growth in the number of published genetic screens in mammalian cells, which will rapidly advance our understanding of mammalian cell biology in normal and disease contexts. Figure 3. CRISPR-based tools to perturb gene function in mammalian cells. 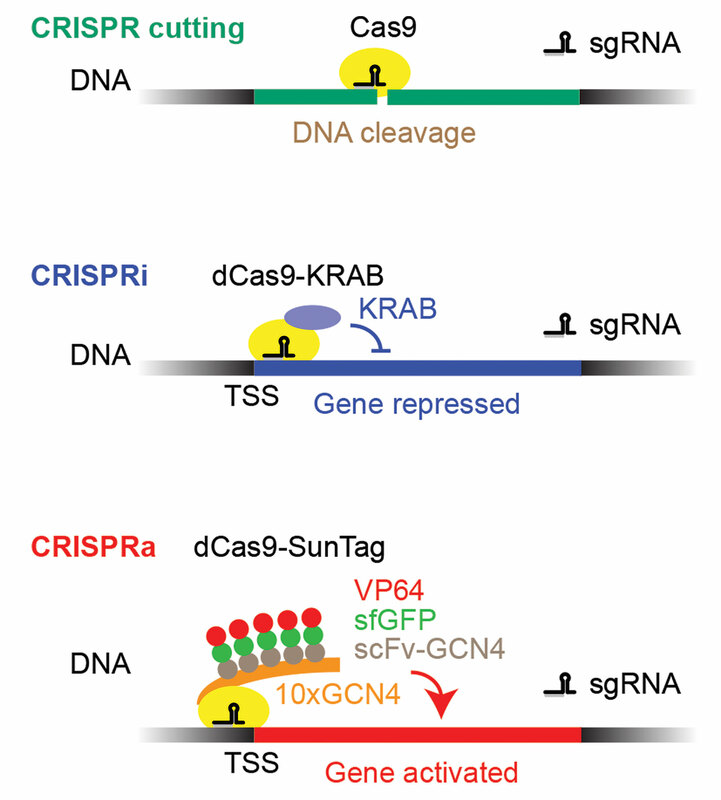 CRISPR cutting: Cas9 mediates DNA cleavage directed to the coding region of a gene by a single guide RNA (sgRNA), resulting in error-prone repair by cellular non-homologous end joining pathways, thereby disrupting gene function (in particular, when frame shifts are introduced). CRISPRi: Deactivated Cas9 (dCas) mediates recruitment of a transcriptional repressor (e.g., KRAB) to the transcription start site of a gene. This is CRISPR interference. CRISPRa: dCas9 mediates recruitment of a transcription activator (e.g., VP64) to the transcription start site of a gene. This is CRISPR activation. Kevin Holden, Ph.D., head of synthetic biology at Synthego will be presenting a talk entitled, “Synthetic sgRNA for CRISPR: Enabling Automation and Therapeutics.” His presentation will focus on chemically modified, synthetic sgRNA and its use in CRISPR/Cas9 gene editing in primary human cells (derived from a human donor), such as T cells and stem cells. “The synthetic sgRNAs are very useful for performing gene editing in primary cells because they contain chemical modifications that protect them from being broken down in cells before they can perform their role in CRISPR,” said Dr. Holden. Recent publications indicate that this is currently the most effective method, and Synthego has developed a new fast, low-cost, efficient method to reproducibly synthesize sgRNAs. The ability to generate both products and services for this technology at increasingly faster rates, and at volumes that allow for high-throughput scale up and automation (for example, screening libraries of gene targets), is going to have a huge impact on what we learn about genes and their roles in both developing and somatic cells. Synthego’s goal is to remove barriers for scientists to conduct their research. And with this new technology, scientists have the opportunity to exponentially increase the speed at which discoveries can be made. When asked about how this technology will impact disease, Dr. Holden noted, “The CRISPR/Cas9 technology has been pretty well hyped already in terms of its therapeutic potential for human disease. It’s difficult to predict which disease states might be impacted most, and in terms of how fast, because the simple truth is: so many different ones are being worked on simultaneously, which I think speaks to the broad, applicative nature of CRISPR/Cas9.” He feels both cancer and diseases of the eye and hematopoietic systems are potential targets. The reprogramming of the immune system, specifically T cells, to orchestrate an immune response to cancers (known as the CAR-T therapies) are likely to have a quick impact. Figure 4. Strategies for pooled genetic screens in mammalian cells. Cells expressing CRISPRi/a machinery are transduced by pooled lentiviral libraries for expression of sgRNAs. Growth/viability-based screens detect the effect of sgRNAs on cell viability, growth, or sensitivity to a selective pressure. FACS-based screens detect phenotypes monitored by a fluorescent reporter or antibody. CRISPR-based genetic screens can be coupled to droplet-based single-cell RNA sequencing to obtain high-dimensional transcriptomic phenotypes for each genetic perturbation.